First off, it was incredible to see all of you at the Women’s March on Saturday. There were between 500 and 1,000 men, women, and children that gathered at the Allen Street Gates to commemorate the one year anniversary of the Women’s March on Washington. I met all kinds of incredible people on Saturday, from a six/seven year old in a Wonder Woman costume, to an elderly woman with a pocket constitution attached to her tricorn hat. It was clear from the march that it was so much more than women fighting for women’s rights – we were marching for all human rights. Okay, now onto today’s content. If you know anything about me, you know that I am extremely vocal about my support of LGBTQA rights. If you don’t know me at all, well, know you know. I grew up with two moms, and I have always believed that, if and whenever I meet somebody I want to spend my life with, I should have the legal right to do that without discrimination, regardless of their gender. 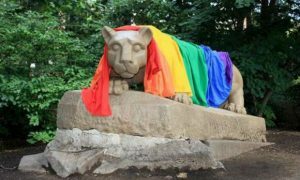 My convictions about LGBT rights have only grown since I came to Penn State, and I’ve ended up arranging both my classes and extracurricular activities in a way where I can do as much research (and blogging, of course) about LGBT rights as possible. If you recall my post from last fall, I visited the LGBTQA Student Resource Center in 101 Boucke to meet the student staffers and to see what I could do to get involved. As any Penn Stater could guess, I ended up on an email ListServ. I’m sure you all got my point here, but I can’t stress it enough: APPLY TO THIS PROGRAM!! Regardless of whether you end up speaking to campus organizations or not, doing the training for this program will make a difference in how you interact with the world. 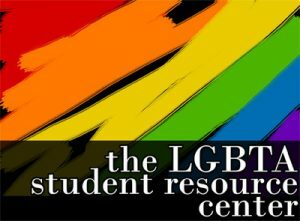 Just speaking with students and staff at the LGBTQA Student Resource Center can help you widen your perspective and be more aware of discrimination on campus. Apply for the Straight Talks program, and see what I mean. I hope to see you all at training! Ever since I met you (though it was an extremely brief meeting) at NSO in May, you have inspired me with your wisdom, compassion, and genuine care for the well-being and rights of all. This blog post (and a bunch of previous ones that I proceeded to read as well) continued the inspiration. Firstly, I wanted to thank you and everyone else for being present at the Women’s March as an excellent representative of the advocacy that this world needs. The slideshow that you included captures a sneak peak of how beautiful democracy truly is. I think it is fascinating the impact that college has on each of us. 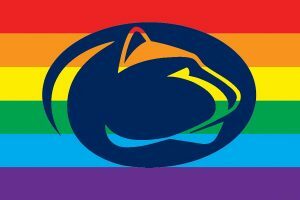 As you stated in your post, your passion to support the LBGTQA community has only deepened at Penn State, and I’m sure it’s reflective of the large quantity of new opportunities/experiences college provides us with. The Straight Talks program you discussed is a prime example of one of these opportunities, and I think you did an excellent job at portraying and sharing its purpose. Once again, thank you for being such a remarkably incredible human who strives each day to make the world a little bit better.